Two full-featured decks, two channels of mixing, and two rows of large performance pads, all in a fully metal enclosure makes the G2V a dynamic and reliable controller with the power to toggle, tap, and twist your tracks into an exhilarating and unique performance. 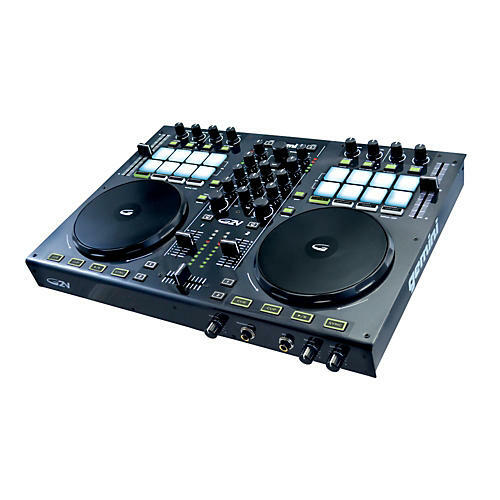 The G2V's DJ tools including pitch fader, key-lock, cue controls, are augmented by advanced sampling controls, on-the-fly loop move, and auto loop and loop roll modes. The full 2-channel mixer gives you constant access to the Gain, EQ, and dedicated Filter controls. A balanced XLR master output, master and booth RCA outputs, and microphone and auxiliary inputs give you all that you could want in when it comes to I/Os. The pre-mapped FX controls for Virtual DJ bring immediate results upon first use, while the fully MIDI mappable and high-resolution 14-bit controls give the G2V the ability to easily be adapted for use with any of your favorite DJ applications. With responsive and detailed performance pads and rotary encoders the G4V's controls are well suited for a wide array of possible assignments. Bringing performance interaction to the forefront the G2V's layout of faders, knobs, and pads is intuitive and the newly designed touch-sensitive mechanical jog wheel is innately responsive. Active LED level monitors and backlit pads and buttons provide the necessary visual feedback required in complicated performances where a computer screen can be pressed for space. With a professional sounding 24-bit PC/MAC audio interface and all the I/O's needed to monitor, record, and playback, the professional sound leaving the G2V is only limited by your imagination.